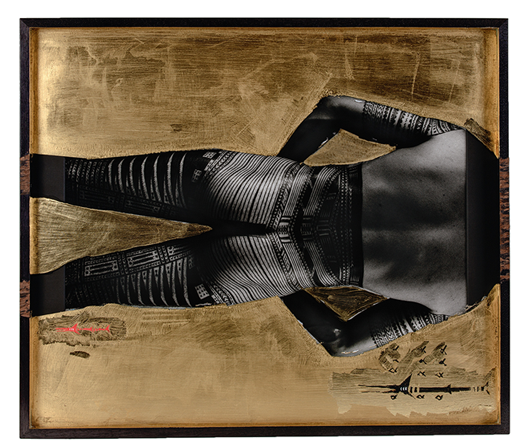 hand-printed fibre-based traditional photo print, imitation gold leaf, paint, glass + wood. The fish swim in the sky and the birds fly in the sea. In the middle lands, man wars against himself. The traditional tattooing art of Samoa for both males and females is a ritualistic covenant of commitment and sacrifice sealed with pain and blood; a ceremonious trial of physical and mental endurance made visible by a completed tatau, named Pe’a for men and Malu for women. Permanently etched into the body are encrypted motifs, codes and symbols detailing physical and spiritual knowledge guiding the initiated from the realm of mortal into the immortal. These codes are a roadmap, a living cartography, charting where we have come from and the return to our ancestors, acting as a spiritual passport to enter the Samoan mythological underworld of Polotu (the world of darkness). 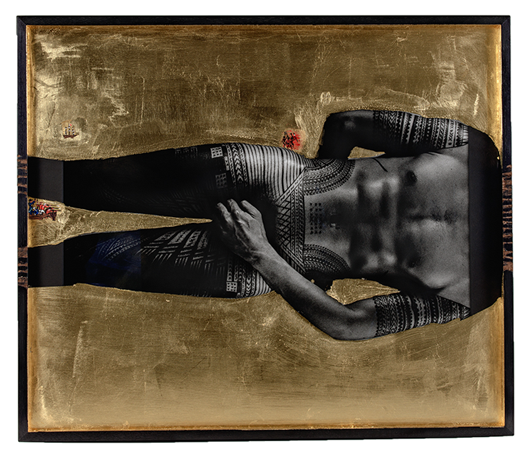 3 brothers, 3 bodies, 3 landscapes reframes the human body as a living landscape, presenting the land as sacred – relating to the idea of Country as sacred to Indigenous peoples all over the world. It considers these cultural similarities between Indigenous Australia and the neighbouring diaspora of the Pacific peoples and nations: the strong and complex links between human presence and the land, the body and its culture. Iconic sacred designs, songs and practices connect to the ancestors of the past, present and future, while secret knowledge, ancient gendered rituals and practices within society suggest universal cultural ideologies. Through visual signs – in this instance, on and around the body – language barriers between nations dissolve so that parallel histories turn into familiar landscapes. Stacked on their sides, these mapped bodies become living landscapes of the celestial and human kingdoms of varying spiritual consciousness, a trinity hovering in alignment. In the middle, humans are in conflict, creating pain and corrupting the land.